A favorite for HOT evenings, Anderson River Park again hosted Shasta Dogs' weekly Distraction Proofing walk. This particular Friday there were an unusual number of herders! Two border collies, a border collie/lab, two Australian Shepherds, four other shepherd or cattledog types, a German Shepherd/lab, and a German Shepherd/Golden Retriever. Given how management-oriented ("Get back in line!") and visually stimulated ("SQUIRREL!") shepherds tend to be, it was delightful how cooperative all the dogs were! Standing around at the beginning with new dogs joining every few minutes is frustrating for the more socially sensitive dogs. But once the group got under way, there was very little dog-to-dog stress. There was a little excitement whenever a bike went by but the dogs all seemed to be enjoying the outing immensely. I credit the fine handling job of the participants, knowing how much space their own dog needed for level-headed comfort-- and taking it! Working in the dog's comfort zone is the only way learning can happen. If you notice these signs of mounting stress, put enough space between your dog and the distraction that the signs fade and the dog is again able to focus on working with you. 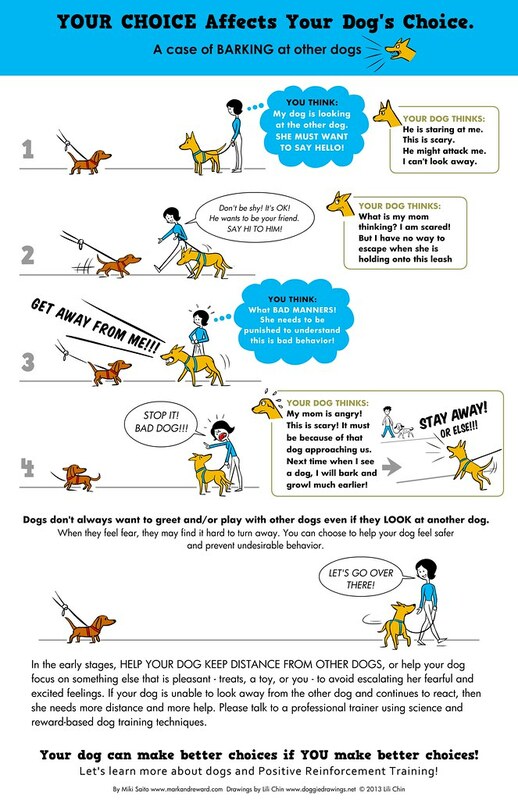 DON'T force or even allow an agitated dog to interact: the pressure can cause reluctant, evasive, "shut down", and often aggressive behavior, or at the least create a habit of staying emotionally "high", mentally unable to respond to the owner. Over time, if you gently and happily expose the dog at only a COMFORTABLE and RATIONAL level, the dog will learn that what used to be exciting or scary is really not a big deal. Practice makes perfect!